San Francisco (THEWILL) – THEWILL has been informed that the body of former first lady Hajiya Maryam Babangida was buried at about 1 a.m WAT on Wednesday near the family mosque at the residence of the Babangida's in Minna, Niger State, in a quiet ceremony. Hajjiya Babangida's body arrived in a private jet from Los Angeles a few hours before she was buried a source said. The Chief Imam of Minna, Alhaji Abu Fari, conducted her funeral. The guests present at the ceremony include former Niger State Governor Abdulkadir Kure, former Head of State and cousin General Abdulsalam Abubakar, Delta State Governor Emmanuel Uduaghan, Osun state Governor Olagunsoye Oyinola, Niger State Governor Muazu Babangida Aliyu, Thisday Publisher Prince Nduka Obaigbena and a few others. 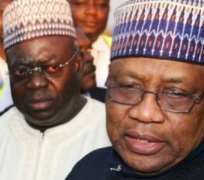 Her husband General Ibrahim Badamasi Babangida and son Mohammed arrived a few hours earlier at about 6.pm, in another German registered jet. The former Head of State we were told was in tears when he alighted from the plane into the hands of friends and associates who had gathered at the Minna airport. Some of those at the airport were General Hamza Abdullahi, Emir of Minna, Alhaji Umaru Bahago, Alhaji Aliko Dangote, Prince Nduka Obaigbena, Justice Alfa Belgore, Chief Tony Anenih and some other dignitaries. Our source also said General Abdulsalam Abubakar could not help sobbing when he walked into the Babangida residence. Hajiya Maryam Babangida, 61, died at UCLA Cancer Centre in Westwood, Los Angeles, California on Sunday morning from ovarian cancer.